We make a serious about-face today, from the lovely modern health food of homemade almond milk to the not-so-pretty ancient seasoning of Asia. Salted Soy Beans, more commonly known as Yellow Bean Sauce or even Fermented Bean Paste, is essential to the cuisines of China and South East Asia. 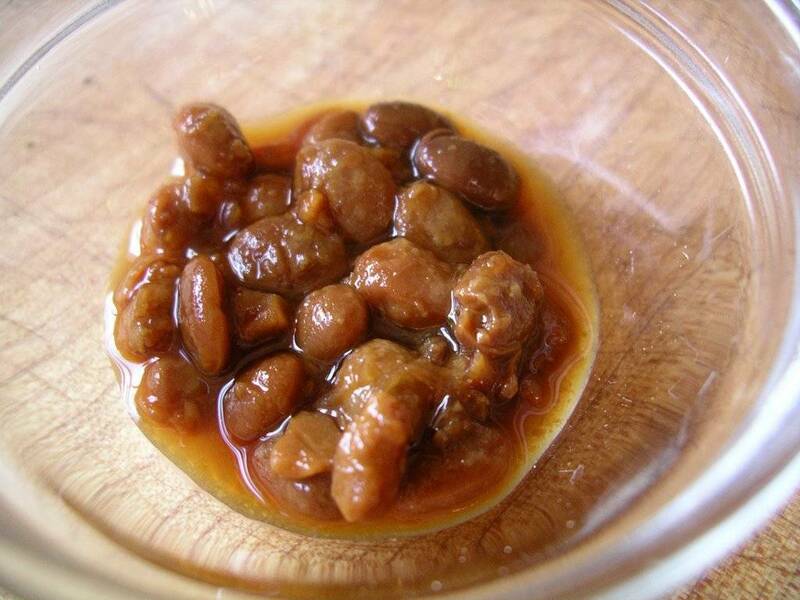 Salted Bean Sauce may not look like much, but its complex and salty umami flavour packs a delicious punch. I talk glowingly about salted soy beans (SSBs) in my Thai cooking class and on my Culinary Tour of Chinatown. I try not to say “You MUST own this to be able to cook authentic-tasting recipes!” because I don’t want to be a self-righteous Asian food nerd and scare people away. But I sometimes want to, very badly, yell, “BUY THIS NOW! YOU WILL THANK ME LATER!” SSBs add so much flavour and taste so good and last so long in the fridge! Similar fermented soy bean products are used throughout Asia, and can sometimes be substituted one for another in a pinch. In a PINCH, mind you. Imagine that fermented soy bean products are as diverse as cheeses, and you will have some idea why you can’t swap them around willy nilly. 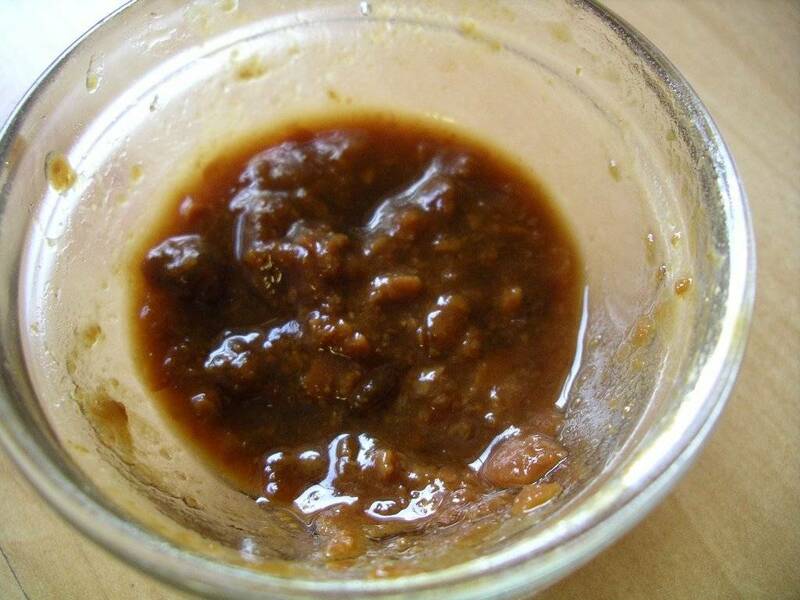 That said, the closest flavour I can liken SSBs to (that most of you will be familiar with) is miso paste, and I often recommend in classes and tours that folks use miso paste as a substitute if they don’t want to purchase another condiment to clog up their fridge. Then I sneakily give them one or two delicious recipes that call for Salted Soy Beans/Yellow Bean Sauce, and cross my fingers that folks will try some. 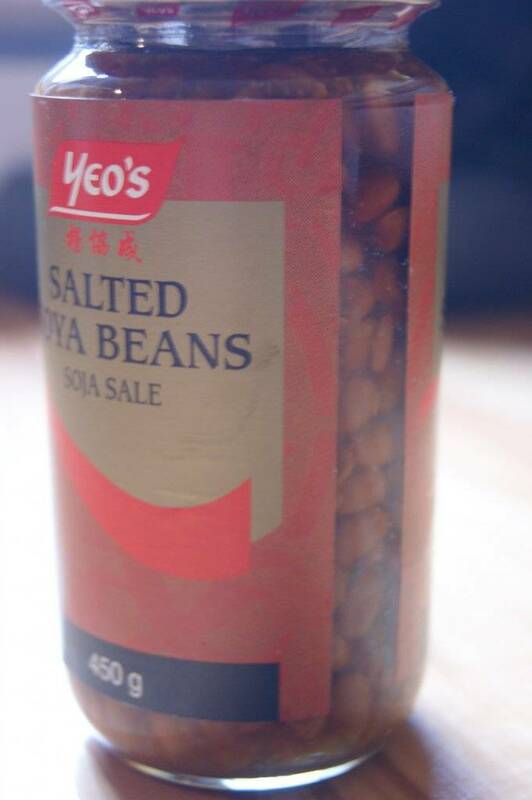 My favourite brand is Yeo’s Salted Soya Beans – the beans come whole in their yummy thick brine, which gives me the option of using them whole, crushed, or pureed (some recipes call for different consistencies). 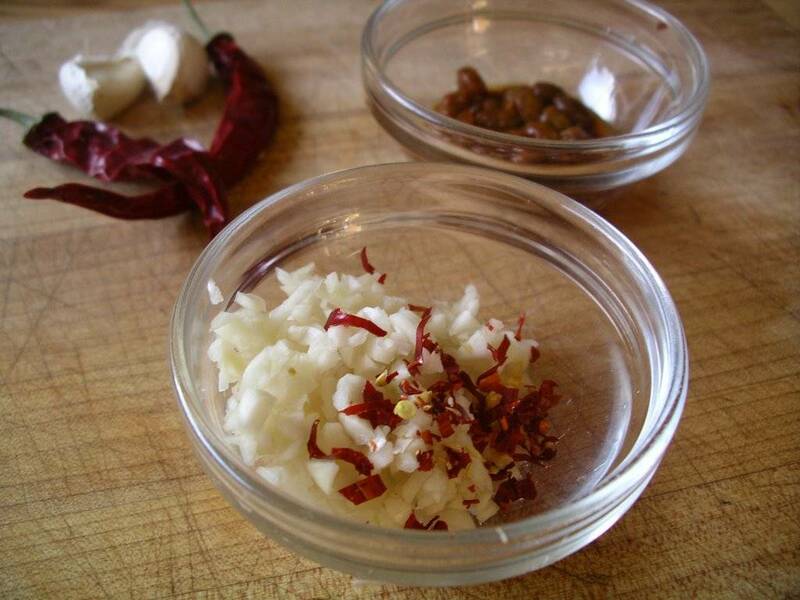 Many recipes will combine SSBs with other pungent ingredients such as chiles, garlic, and ginger. Famous Thai recipes that rely on SSBs are Lat Na (aka Rad Na) and Khao Man Gai. One of my personal favourite uses for Salted Soy Beans is Thai Stir-Fried Greens with Garlic, which I have blogged about before. In Chinese cooking, SSBs can be found most often in Northern-style cuisine, which runs to heartier fare, wheat-based dumplings and noodles, and lots of pickled and preserved foods. I love Chinese salted soy beans cooked with ground pork and ginger to serve with pillowy egg noodles. And I’ve included the recipe for you to try! You can find a variety of Salted Soy Beans/Yellow Bean sauces (including Yeo’s) in Victoria’s Chinatown at Fisgard Market, in the sauce/condiment aisle, about half way down. Now, on to the real reason you are here, I am sure: THE COOKING CLASS GIVEAWAY! Remember, there will be a chance to win every Thursday and Monday of the next two weeks, so keep checking back. To recap: Rancho Vignola has stepped up once again to sponsor my business activities, this time by covering 50% of the cost of one of my Moroccan cooking classes. What this means for you, dear readers, is that I will be selling twelve spots at a Moroccan cooking class for half-price! That’s $45 for a full three-hour hands-on cooking class, and includes a take-home recipe booklet and full delicious meal. Kind of like a Chinese-style pasta sauce, this is very easy and quick to make. I often add sautéed or stir-fried Chinese cabbage or greens to the sauce and noodles for a more complete meal. Place the salted soy beans in a bowl and mash lightly with a fork or the back of a spoon. Add the sambal oelek, or Chinese chile paste, and the sugar. Stir to mix well. Heat a large sauté pan over medium-high heat. Add the oil and swirl to coat bottom of the pan. Add the ginger and stir fry until fragrant, about 20 to 30 seconds. Add the pork and stir fry for 3 minutes, until pork meat separates into grains and loses its pink colour. Add the salted soy bean mixture and cook for 3 to 4 minutes more. Stir in the scallions and immediately turn off the heat. Meanwhile, bring a large pot of water to the boil. Add the noodles and cook, stirring occasionally to help separate the noodles, until done to your liking, 3 to 5 minutes for fresh noodles, 7 to 10 minutes for dried. Drain the noodles well. As soon as they are drained, add the noodles to the sauce mixture. Drizzle in the sesame oil and stir everything together well with tongs or two wooden spoons to combine the flavours and keep the noodles from sticking together. Serve immediately, with some stir-fried Chinese cabbage or greens on top or on the side. I’ve cleared my schedule for Feb. 16th….wishful thinking! I love experimenting with new flavours so I’ll definitely add it to my shopping list! My Thai daughter-in-law will be interested in the SSBs info, since she’s always looking for Asian ingredients. Love the blog. Would love to do the class. I was always interested in going to Moroco this might be as close as I get! Well I know what I’m making for dinner! Thanks Heidi. I’m making this tonight. I wonder how cooking a volume of the sauce (without greens) will be to freeze in small containers. I’m going to find out! Hmm…salted soy beans have not been on my ingredient list before, I’ll have to try them! I have a jar of salted soy beans in my fridge. Are they good forever, or how long once opened? Please enter me into the Moroccan cooking class giveaway. Hi Christine, they last for quite a while – at least a year, if not longer. Salted soy beans sound interesting, especially to try authentic Asian food. I will have to get some! Love this recipe — it was included in your chinatown tour recipe booklet and it is now family favourite!! Still have fingers and toes crossed on the Moroccan cooking class giveaway!! Wow, whether or not I win the half price cooking class, I am DEFINITELY giving this recipe a try. I have been wanting to cook using fresh egg noodles and this recipe is just the ticket. That is my idea of a good coincidence! Thanks Heidi. Your blog hits the spot, Heidi! Such a coincidence because I just finished an operations meeting with the pork producer partner with whom we run an organic feed mill. We just spent 3.5 hours discussing how to co-operatively market his pork and our poultry. 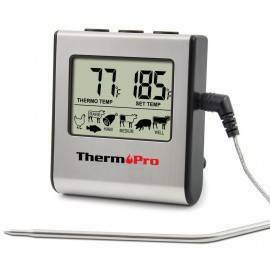 On the way back from doing the evening chores, I pulled a pkg of pork out of the freezer for tonight’s dinner and then read your email & blog. 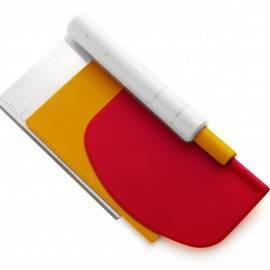 I have all the ingredients AND a new pasta maker – what luck!!! Darn auto correct… I meant popping!! Hey Heidi. Are the salted soy beans gluten free? Hi Fiona, some brands are gluten free, but most are not. Fermented soy beans frequently have a wheat culture added to them to help with the fermentation. 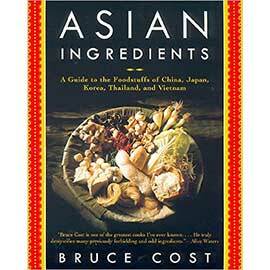 Will have to try this recipe out and impress my mother – Happy Chinese New Year! You know what Horses love? To eat Moroccan food! Well, they probably don’t but I want to win that class!!! I have a recipe given to me by my Indonesian mother-in-law that I have been trying to find on the internet for years. 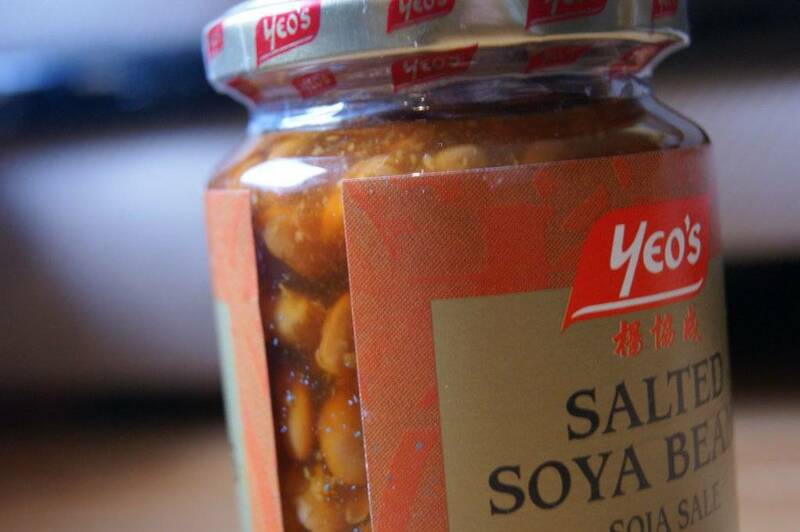 The sauce is made up of Yeo’s salted soy beans, rice vinegar, & sambal oelek, etc. This is for dipping fried green onion dumplings in. My husband’s family call it Gooda Gooda. Have you ever heard of this kind of recipe? It is an amazing recipe and I have wondered why I can’t find anything even close on the internet. Hi Carol, I sent you an email. But in a nutshell, no I have never heard of Gooda Gooda, although it sounds delicious.